From the nation's capital to the crossroads of rural America, the increased threats of violence unsettles us all. Often times these threats are carefully hidden from human detection, but thanks to ATF's Explosives Detection Canines, they can still be found. The ATF explosives detection canine, a graduate of ATF's 10 week explosive detection training program, has been conditioned to detect explosives, explosives residue, and post blast evidence. As a bonus, because of their conditioning to smokeless powder and other explosive fillers, ATF trained explosives detection canines can detect firearms and ammunition hidden in containers and vehicles, on persons and buried underground. 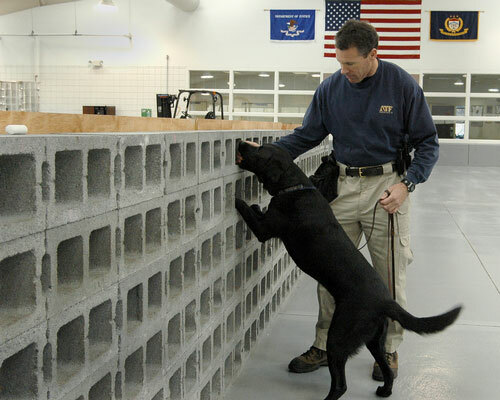 With the assistance of support systems such as the National Response Team, Explosives Technology Branch, ATF Laboratories, Certified Explosives Specialists, and the ATF Firearms Branch and Tracing Center, the ATF canine program is producing a viable tool to assist law enforcement with their war on violent crime. While there is a great need for explosives-detecting instruments, there is also a great need for law enforcement agencies to have an explosives-detecting canine capable of detecting explosives and firearms threats. To support ATF's mission and that of other law enforcement agencies, ATF applied knowledge gained from its long established accelerant detection canine program and developed a scientifically based explosives detection canine program that trains dogs capable of detecting a myriad of different explosives compound. ATF trained and certified canines learn explosives odor recognition through food and praise reward conditioning. This training methodology allows for a canine to be repeatedly exposed to various explosives odors daily, thus reinforcing these odors to the canine continually. In the early 1990's, ATF, the Connecticut State Police and the U.S, Department of State, Office of Antiterrorism Assistance initiated a program wherein ATF would provide trained explosives detection canine teams to selected foreign countries to assist them in their efforts to combat terrorism. Thus far, ATF has certified over 300 canines and deployed them to 13 different countries, including Argentina, Australia, Cyprus, Czech Republic, Chile, Egypt, Greece, Israel, Italy, Jordan, Malaysia, Poland, and South Africa. Currently, ATF has 21 ATF agent/handlers working with explosives detection canines located throughout the United States. In the summer of 1998, the ATF canine program also began offering this training to other Federal, State, and local law enforcement agencies. As a public service, ATF sponsors educational programs and training for schools, civic groups, and other law enforcement agencies about explosives and firearms, explosives and firearms detection, and other safety issues. During many of these programs, a canine team will promote community safety issues through prevention and detection demonstrations. As the Federal Government's explosives and post blast experts, ATF offers certified explosives detection canine to other Federal, State, local and foreign law enforcement agencies. 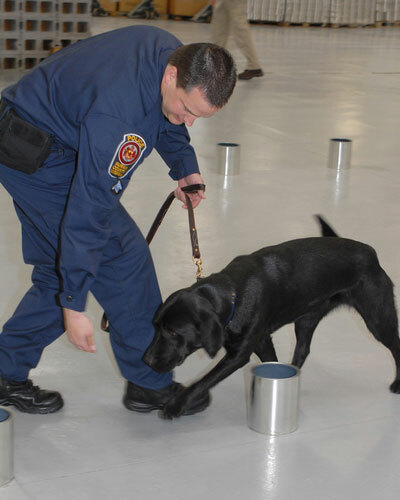 ATF uses a food and praise reward training methodology that exposes canines to five basic explosives groups, including chemical compounds used in an estimated 19,000 explosives formulas. It is believed by ATF that exposing canines to various explosives from the basic explosive families will give the dog the ability to detect the widest range of commercial or improvised explosives possible when working in field. Successful detection of an explosive or firearm earn the canine a food and praise reward, which encourages repetition. To earn ATF certification, all dogs must pass a blind test wherein they must successfully detect 20 different explosives odors, two of which they were never exposed to during training. The scientific methodology, and the training and testing protocols are certified by the ATF National Laboratory, and produce an extremely versatile, mobile, and accurate explosives detection tool. Risks from explosives have become more familiar in today's society, highlighting the need for better prevention and detection measures. ATF's Explosives Detection Canine Program is one key to nationwide safety. ATF began training Accelerant Detection Canines (ADC's) in 1986. These specialty canines are trained to detect a variety of ignitable liquids that could be used to initiate a fire. The Accelerant Detection Canine Program (ADCP) is available to State and local law enforcement / fire service agencies who meet various criteria and are willing to commit to a 5-year memorandum of agreement. Handlers attend a 5-week training course at the ATF Canine Training Center in Front Royal, Virginia, then return to their respective departments to begin working operationally. These teams are utilized by the ATF National Response Team on fire-related callouts. All ATF ADC teams are recertified on a yearly basis. Currently, there are approximately 50 canine teams across the country participating in the ADCP.